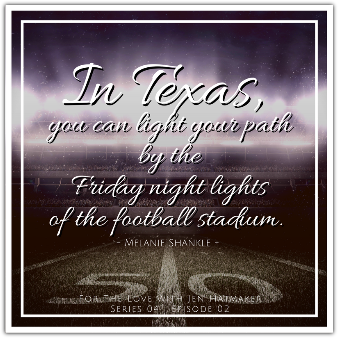 Jen has an epic chat with one of her favorite fellow fall football fans--New York Times bestselling author, Melanie Shankle. You won't want to miss their school song sing-off, their thoughts on game day foods, and learning why Melanie actually stayed in college longer than she had to [next level football fandom]. They'll also discuss fall fashion and how some trends elude them (just say "no" to Mom Jeans). They'll also discuss how teens now are different than their teen selves in the 80's. Remember hot rollers? They do. 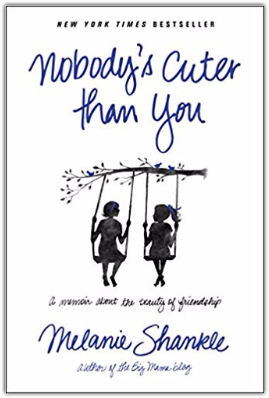 We'll also learn about Melanie's new book project Church of the Small Things, and what it means, this fall, to really cherish the present season of life that you're in. 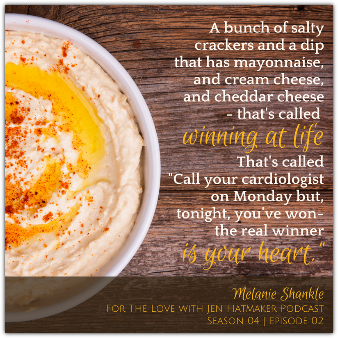 Narrator: Welcome to the “For the Love Podcast” with bestselling author Jen Hatmaker. Come on in, and join us for a chat with Jen and friends about all the things we love. Now, here’s Jen. Jen: Hey everybody, welcome to the For The Love podcast, it's me Jen Hatmaker. I'm glad to have you today. We're in a really fun series called “For the Love of Fall and Holidays.” Some of my Tip-Top favorite things. So as we were thinking about who loves fall as much as I do; like who's just bananas about football and tall boots, and leaves on the ground as me. It was immediately clear that we had to have my good friend Melanie Shankle on. If you already know Melanie, you already know that you're going to be like totally delighted during this interview. She's so funny and so fun and we've been friends for years and years and years. 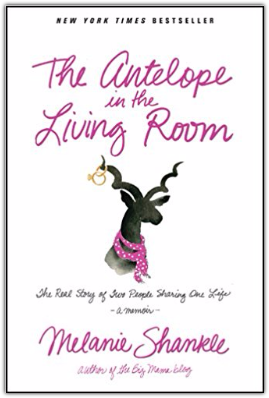 She's a New York Times bestselling author, so she's written Nobody's Cuter Than You., The Antelope in the Living Room and Sparkly Green Earrings. She’s got a brand new book - it just came out called Church of the Small Things. I told her in the interview I honestly think it's her best one. I absolutely love it. She's had the Big Mama Blog for a decade--maybe even 11 years at this point--and she's just built this amazing space for all this time where she is funny and she is tender. If you don't already follow and love Melanie, you're definitely going to want to after this, after you hear our hour long talk. She speaks--she's all over the place on her book tour this fall. She's a fellow Texan--a super proud Texas A&M alum, a self-professed Target junkie--she's everything that we love. She lives in San Antonio with her husband Perry and hurt her teenage daughter Caroline. And then she's got two dogs Piper and Mabel who you see all the time pop up on her Instagram feed and everything. She is just one of my most fun friends, so we sort of talk about everything in this hour from football, to parenting, to deciding to make the good decision to drive our kids to school in the morning with a bra on. So it's really all in here. I hope you enjoy this chat because I know I sure, sure, sure did. So you guys, welcome Melanie to the podcast. ​Melanie: Good morning. How are you? Jen: Well it's 8:30, so I'm wearing the shirt I slept in. Melanie: Oh I'm like barely out of my pajamas, just enough so that if I got in a wreck on the way to take Caroline to school. I wouldn't shame the family. That's the level of dressed I am right now. Jen: Did you do what I do when I take the kids to school, which is to drive barefoot? Melanie: Oh for sure. Yes. Yes. Then people say, “hey, there's Caroline Shankle’s mom--she's in her sweatpants and barefoot.” I will have a bra on. I do have standards, because I do put a bra on. I'm a little bit scared to drive braless. Jen: I do the same thing, although I only do that because I learned the hard way. When Remy was in first grade, I'd drive her to school and I mean it was it was as bad as you could think. If you can just think of the worst picture of me you've ever seen in your life. I mean like yesterday's makeup, glasses, absolutely no bra, no shoes. The worst, worst, worst. I cannot remember exactly what happened, but I had to walk her into school, with my bare feet, like Britney Spears going to the bathroom. It was humiliating. I was so embarrassed. 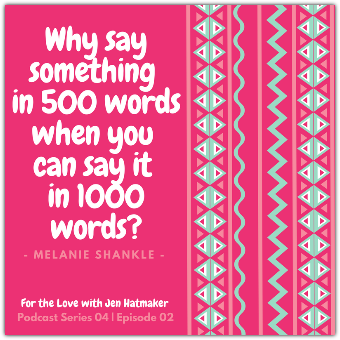 Melanie: Keeping it classy, Jen Hatmaker. I had a friend who actually, and that's part of her…she was driving home. She's actually the artist who did my cover art for the book. She has a little boy that was in kindergarten last year, and she was driving home, and she got hit by some violent stomach bug and like passed out and crashed into a tree in somebody's front yard like. She been in her pajamas, with no bra. One of the garbage man had to stop and help her. Her husband is like, “you seriously looked homeless in the back of the ambulance.” They had to call it an ambulance. Jen: He was coming in with the comfort, is what you're saying. Melanie: He was affirming her, making her feel better about that already embarrassing situation. But like that whole scenario, it scared me straight. That could happen to any of us at any given time. Like the random stomach bug that makes you pass out—it’s so likely. We should positively gear our mornings around that possibility now. Melanie: You never know. You never know. Jen: That is an awful story. By the way we're going to get around to her again because her artwork is so amazing. It's so different and unique. I love her style. Melanie: I know we're going to have to talk about that. Jen: Let’s circle back around your book in a minute, but first we’re gonna talk about fall because you know this is the For the Love of Fall and Holiday series which I can think of like two people who would make that a series on a podcast--me and you. Melanie: Yes. Here we are. Jen: “for the love of fall… is that?” That’s a whole category in itself. Melanie: Yes. That's like the theme of my life about fall. ​Jen: Exactly you and I. You're the perfect person for this. This is the most wonderful time of the year. So if people know us, they know that both of us are maybe unreasonably devoted to our college football teams and all things football. Football watching, football parties, football food--all the things--going to the actual games. So let's talk about football for just a minute because some of my very best friends are also in football space, and so we'll literally sit around together as girls, and talk about pre-season picks up or talk about rankings. It's hilarious. You're the same way. Melanie: Yeah I'm totally the same way. We always laugh; my best friend and I always laugh, because when football season, like preseason football, and I'm on the Tex-Ags Website, which is all things Aggie football, because that's my team. Jen: So, is it true that you stayed in college an extra year just for one more year of sports? Is that a legend. Is that just lore? Melanie: Jen, that is real thing. I mean, there were a couple of reasons. Maybe my grades; maybe the fact that I had to get off scholastic probation to actually graduate. That could have also played a role. I went to school in the 90s and that's when A&M--it was our glory years. So basically, I took four hours my last semester. It was a lab, and one other class. So basically, I was one of those old students that like just showed up in the MSC and ate chicken fingers with people because I didn't have class--ever. I would go to my one lab a week, and then get ready for football games. I still can't believe that my dad--I don't think he really totally knew what he was paying for. ​Jen: I want everybody to understand that the the full scale of your your Aggie loyalty. More than than half the people listening to this podcast do not understand Texas football. They don't understand how it runs deep. It's just so insane here. Like, how can we best describe what football is like in the state of Texas? Melanie: OK, so I have this great thing. I think number one; it's kind of like a religion in the state of Texas for a lot of people. I heard this thing--it was a Southwest pilot--and he was talking about that he loves flying over Texas on Friday nights in the fall because he said you could literally light your path by the friday night lights. By the stadium lights. So, I was like “that's it. In Texas. you can light our path by the lights of the football stadium.” Everybody's a fanatic and it doesn't really matter if it's high school football or college football. We’re a football crazy state. Jen: You know it's true. It basically starts when our sons are like somewhere between like three and a half and four. That's about the time we’re like, “well it's almost too late to get them started. Melanie: I mean, it's time time if they're going to have a chance to be Troy Aikman. Jen: Here’s your chance to demonstrate your loyalty. I know that you've always mentioned how singing is your gift. I want to be able to display it. Can you sing all of the Aggie War Hymn? Melanie: Oh, I can. Do you think all of it--the whole thing? Jen: I want you to sing at least part of it. Jen: It was Caleb when he was a widdle baby. I only watched it 40 million times and I could not even handle it. ​Melanie: Like I wanted to cry for you when I saw it. I even commented, I was like “I've never liked that song, but I adore it in this moment.” That song has given me nightmares in my life, but at this moment it is precious, precious. OK I will go. I’m gonna go for the first little part. I cannot believe I'm about to sing this. Melanie: This is going to sound so normal to people who don't know anything about this. the eyes of Texas are upon you. That is the song they sing so well. Sounds like Hell! Melanie: Ok, so my editor went with me to the A&M game and she had never been. Jen: Somewhere between like 60 and 90. Melanie: Yes, yes. A lot. Jen: It’s just fully obnoxious. I feel compelled to sort of share this with you since you just so graciously sang on my podcast, so thank you. You know that Brandon and I actually went to Oklahoma Baptist University. It’s this little tiny liberal arts Baptist school right outside Oklahoma City. Now we've lived in Texas for almost 20 years. So we didn't have a football team in college, so we just adopted our city or adopted our school here. Our little school had a little chant, and the beginning of yours makes me think of it, and I'm going to sing it for you so you can just know, this is how Baptists do it. All right, so you've got a big 60,000 kids school at Texas A&M. This is how a 3000 school Baptist College gets. We have a little thing that it goes like this--I might not get this right. I probably haven't done this in 15 years. Oh! Oh! Hoogula choogula choogula can. Melanie: It’s like you are speaking in tongues from the Baptist university. I mean that is hilarious. Oh my gosh. Jen: It’s just nonsense. It's just absolute nonsense and I'm just saying we all have our things, is what I’m saying to you. Melanie: Here’s what I appreciate. I bet you didn't remember to pack somebody's lunch today, but you remember every word of that—that is the way the brain works, which I think is fascinating. Jen: It's so true. My kids used to ask me to sing that for them when they were little because they just thought, “well look, it's just proof that mom’s a loony. I mean just she's just saying loony words. Alright, let's talk about football food. How do you party? How do you do football games? Do you have season tickets? ​Melanie: No, we don’t have season tickets. I wish we did. I mean you know how it is. We are in the that same season of life. We're three hours away. So like I try to get back here to the three games if I can. But it's just too hard. And Caroline plays soccer and so you know that's like a whole other thing. So some day, I do want to have season tickets, but we don’t right now. So my ideal watching scenario is to go to my best friend Gully’s house. So depending on the time of day, there's nothing worse than being doomed to the 11 o'clock kickoff start. It's actually worse, because then you're like, “do we do pigs in a blanket? Do we do breakfast tacos? What do we do?” And it just doesn't feel as celebratory. Jen: That's my favorite. Then you could you really start the festivities. In our family, if we can, we start it with college game day at 9:30 in the morning. Jen: That’s not even weird. Let's just watch it all day. Do you tailgate too? Do you ever do that? Is there like a faction of Aggie alum in your town? Jen: Oh my gosh, that game--I can't. So our general rule is we're not really allowed to watch football with people who don't know us well enough to know that we just temporarily lose our minds. She was like, “no you can't.” She un-ironically forbid him to ever watch in public. She's like, “no, your Texas turrets cannot be contained and we have to live by these people, these are our neighbors; our fellow citizens. You can't take us out of the game with your football watching shenanigans. ​Melanie: That's really how I get, so we tend to watch just together and then we base our food options on--like we kind of try to have a theme. So sometimes it's like a chips and guacamole, and then we'll do like tacos and that kind of thing. Sometimes we'll just go straight up--like all the cheese dips we could possibly come up with. What do you all do? When you kind of feel at the end of the night, that we had a meal but you’re so full, I feel good about that scenario. Jen: And all your fingers are swollen from the sodium intake cause you ate essentially like a bucket of chips. Melanie: A bunch of salty crackers and then a dip that had mayonnaise and cream cheese and cheddar cheese. That's called winning at life. That's called “call your cardiologist on Monday. But you won tonight--the real winner is your heart." Jen: Some people don't know what we're talking about. They don't know that that's how we make you know nine out of 10 dips. That's our starter pack. Mayonnaise. Yeah, I mean that's just…everything you just said sounds delicious. And we bake it. Yeah, it's pretty gross in the sense that it's just one big congealed pile of fat, but it’s delicious. Melanie: It tastes great on a cracker. Jen: Let's talk about fall fashion. You know you know this because I told you; you're a fashion go-to for me and on your blog (we’ll talk about that in a second, too) but you've had a fashion Friday feature, gosh, forever. How long have you been doing Fashion Friday? ​Jen: And I love it. And I learned early on. I need not read your blog on Fridays because I just I can't. You and I have a similar fashion ethos. Like the boots, the skinny jeans, the long Cardigans the scarf. We wear the same clothes. We like the same things like that flowy Free People. You introduced me to all that. And so I have no resistance to your suggestions; none. I cannot go to your Fashion Friday feature--I can't, I can't, I can't. I probably have ordered 30 things, on Fashion Friday. What do you think is in this year? What do you see? What do you like. Be honest. Melanie: I'm going to tell you not much I like right now. Jen: OK. Tell me about your feelings. Jen: Like for 30 years. “And so that's what she's doing.” You know, maybe I'll come around because I also felt --and now it's kind of come back around for a long time after college--and you and I are the same age; the shirt that tied? Like how you could tie a denim shirt at your waist or tie a plaid shirt? Look, it took me so long to let go of that, I really grieve the loss of the shirt when it was gone because it was such a great solution. It's so good to not have to tuck in. That's my whole thing. I don't want to have to tuck anything. And I know these fashion bloggers try to sell you. Jen: Well, you know what I'm seeing, is the half tuck, you know what I mean? ​Melanie: Here you go, fashion blogger. It's a sloppy tuck and I'm like, “don’t try to sell me on your sloppy tuck. I don't like it. I don't understand it. That I've got to tuck in this first part and then I don't know how much to tuck in. I don't know how much to leave out. And then I need a belt or some—I just don’t—and they’re like “it’s so much more flattering.” I'm like “if you're 30, but if you're 45. Not so much.” Like I need a loose tunic situation. Jen: I'm all the way here for the loose tunic. I mean Free People; I essentially think was a company created for me on my behalf. At my behest. Melanie: Like Sydney’s kind of a little fashionista, isn't she? She's like, she’s put together. Melanie: You know what you don’t want to see me in is a high-waisted mini skirt. I mean, like I can't. I’ve done mom jeans and I can’t go back to mom jeans. Like they didn't look good. Don't you watch those old episodes of Friends sometimes and I thought Rachel looked so good and I'm like and she's just in some straight up mom jeans; like we didn’t know. And now that we know better we need to do better. I mean I don't think you can go back to that. Melanie: Trying is just very overrated. I just can't. It's funny how it switches, because I felt for so long like I would try to help Caroline put together stuff, and I still do because I mean I do like fashion. I just don't like the current stuff that much. But like yesterday I came out in a top and I was like, “what do you think about that?” And she was like “oh I'd totally borrow that,” and I'm like “what?” It's like the heavens opened. She's like “I would wear that.” I'm like, that's the highest compliment that my 14-year old would actually wear that shirt. Melanie: I think everything now and see like Caroline would never wear this stuff but all that florally, super ruffle-ly like the sleeves that are like super puffy and all that. All I can think of is that Seinfeld--that's like a puffy pirate shirt and I can't. I think it looks cute on other people. I can't do it. It's too precious for me. I can't look that darling. I can't. That's not my wheel house. Jen: You know this is making me laugh so hard because I mean, I dress like you. Exactly. And that's my dressiest—that’s the highest level. Like jeans and boots and a long cardigan. That's as good as it gets for me that's my nicest thing. I just need to have my hand held. I'm just no good. I'm just I can't I know how to be dressy. I don't know. I don't know. I don't know what's appropriate. Jen: I got so confused shopping for some book launch clothes for Moxie that I'm going to send you a text. When we're done here, I'm going to go inside and take a picture of it in my closet and send it to you and you will howl. It looks like a dress out of the 60’s, kind of with psychedelic pink and orange swirls, and I bought high heel pink shoes. What happened? What happened in there? It's like I came out of the trenches, like out of war, and I had pink high heels. I don't know. I mean, I don’t know how to describe what happened. Well it just gets confusing. That's why. Who thinks about how to be on a TV show? That's not a normal way to think about your body. How do these people do it all the time? What's also weird is when you're on these these shows is all these people all these little hosts and the people that are on their shows they're miniature people. I cannot even handle the smallness of their bodies. I just keep looking and I'm like, “how are you just walking around on those legs? Like how can you even hold upright? Melanie: It tells you that the whole entertainment world is a bunch of Polly Pockets. They’re just teeny. Little bitty hands. Jen: They are. And you and I are tall. We come in like giants. Like a giant person with my big man paws. Like walking around the studio like just this giant person. I already have this really big head. I mean nothing makes me feel like a more enormous human being than a TV show. I just can't. I hate it. Sponsor Message: Jen: Hey everyone! 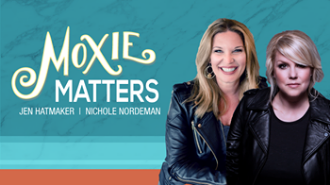 It’s Jen, I’m gonna interrupt the show real quick, just to let you know, that my ride or die friend Nichole Nordeman and I are hitting the road again in 2018 on the Moxie Matters Tour. We could not be more excited. The fall tour was just beyond, so exciting and so wonderful, and we are thrilled to get to bring some spring dates to you in 2018. So absolutely grab your girlfriends, your daughters, your moms, your neighbors, and come be reminded that every part of your journey matters and leads to this bigger, more beautiful story. Hey, this is the perfect holiday gift. Send this to your person and say “hint hint” this is what I want. You can get tickets at MoxieMattersTour.com. We cannot wait to see you, so again, visit MoxieMattersTour.com today to get your tickets. Jen: Let's talk about your book. Well, let me go back and let's talk about your blog first because a lot of my listeners are going to already know and love you. They've been following you here for years. But would you say you were on the front edge of blogging? Jen: I'm going to write about some stuff I want to talk about. I mean no big grandiose ideas right? I’m just gonna have a little space. Melanie: At the time, my parents lived out of town, it's just a place, like my friends can read it and keep up on my life. I had read some blogs when I was off on maternity leave that I thought were really funny and so I was like “I think I can do that. That’s a good way to keep up with your memories. I'm never going to scrapbook, so why not, right?” So it's crazy to me. I will say the blog is probably the thing, other than being a mom, that I have done the most consistently in my entire adult life. Jen: That's amazing. Tell everybody how you named it. A lot of us know the story, but a lot of people don’t. Melanie: So it’s called Big Mama. It started, because like I said, Caroline wasn't quite three, and so at the time I was trying to potty train her. This was in July 2006, so I had a deadline--she had to be potty trained before she started school on August 15th or she could not start in a three-year old class. So it was like desperate times--like I've got to be able to send her to preschool. So because I was working full time, I was a pharmaceutical rep at the time too. So her not going to school was not an option. She had to be potty trained. Also, I was trying to get rid of her pacifier because I'd already been lying to the pediatrician. “Oh yeah, she's totally off the pacifier. Yeah, we’re done.” She's three, she still has the pacifier in her mouth. And so I kept telling her all the time just like “you're such a big girl, you're a big girl now, you're almost three, you're a big girl,” and so she decided “big” was like a great thing to be, and so she started calling me big mama. She would would be like “Big mama, it’s time to go to the store. come on Big Mama.” I was like, “well that’s precious.” So, I named the blog that. I always say now, had I known it was going to be a thing, I don't think I would have called it big mama. Jen: I mean, that branded you for the next decade. Jen: I love it. How long was it til the blog started kind of catching fire? Melanie: You know, it’s funny to think back. I remember there was a day early on, probably like that fall, that I wrote something about my family or something. Sophie, who writes at Boo Mama, she linked to me. She had been blogging for about six months longer than me, she linked to me, and I remember looking at my stats that day and I was like, “oh my gosh. A hundred people come to my blog today.” I was freaked out. I was like “100 people came today.” I couldn't even believe it. Then it seems like it just grew from there and it was probably like 2008, when I looked up, I was like “oh this has become a thing, it was so weird. 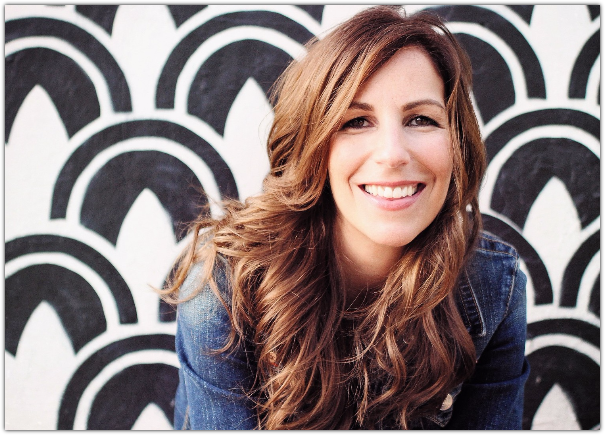 Then somebody from Proverbs 31 contacted me and it was like Lysa Terkeurst would like for you to come to her conference and teach a class on blogging—which, how funny is that now to teach a class on blogging? But I was like, whoah. Like it was such a revelation to me because I had never I'd never had set out with like goals. I mean I'm not really a person to set goals or have like dreams or ambition. So for that to happen was like, how did this just come about? Jen: I love that, because it kind of grew organically, which to me means you got to just be who you were that whole time. You know, it grew with you and around your honest self and how you were writing and what you were sharing. To me, you're one of those people that built one of the most sincere and like “true to you” spaces there is. Later, when we were all coming to blogging late in the game, at that point blogging was considered like a “platform builder” and here's how you're going to get your thing out your message out, your whatever. So people started approaching blogging as a marketing tool, as a brand builder. So it had that hint of disingenuous writing, but yours was fully you from day one. All the way Melanie. That’s why people loved it so much and still love it. So your blog is going amazing, obviously. Then you make the leap to writing books, which we're all so, so, so glad that you did. Isn't it funny that we're writers? That’s not what either one of us trained to do. It's just how it worked out. Melanie: I really thought about that this week because I was back at A&M and I thought my college self could not have even envisioned this, because you can't say, “I want to grow up to be a writer” because people hear basically, I’m going to live in my parents basement and wear sweatpants all the time, which the truth really is that you wear sweatpants all the time and you live in your own basement. ​Melanie: If you have one. I can remember thinking it would be cool to be a writer. But I mean, how do you do that? Like how does that even happen? That's not a real thing. It's not a real job. Jen: No, exactly that's not a real thing. I mean you and I, both of us wrote on this side for funzie's. I mean, it was just like these are these little things that we did. 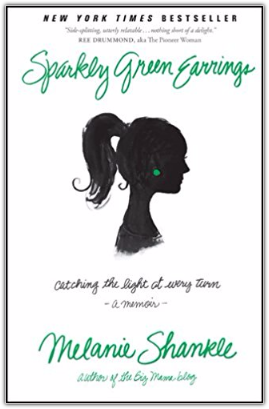 So your first book was Sparkly Green Earrings, which was super delightful. Here's a quote from Sparkly Green Earrings that you wrote about, and that book was all about—listener--that was all about motherhood. 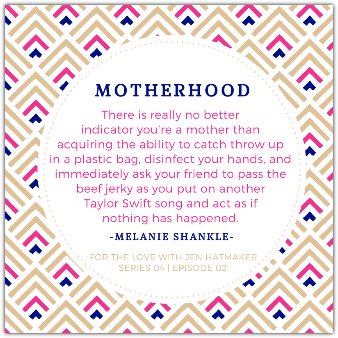 “There is really no better indicator you’re a mother than acquiring the ability to catch throw up in a plastic bag, disinfect your hands, and immediately ask your friend to pass the beef jerky as you put on another Taylor Swift song and act as if nothing has happened. Melanie: There you have it. Jen: Motherhood is so glamorous. Melanie: It’s so fancy. I mean you know it's just--I mean for years my best friend Gully and I—and we still do, we take our kids on these road trips every summer and her youngest gets carsick every single time. You would think that we would learn some lessons there. But you know what the lesson is we've learned; pack plastic bags, and some wipes and pass the beef jerky. That's what you do. Keep on driving. Jen: As a writer, did you like the book writing process as opposed to the blog writing world? What was your feeling when you like transitioned over to books? Melanie: I think transitioning was really hard. For you, you did books first. So, it was really hard to go from a thousand-word blog post, which is what mine usually average because I'm a little wordy. Why say something in 500 words when you can say it in a thousand words? Jen: That’s my life motto. Melanie: Let’s use a lot of words. But to tell a story; and with the blog I always come from the angle of everybody knows who the players are. I don't have to introduce anybody if you've been reading the blog. It's like my best friend Gully, Mimi and Bops are my parents, you know whatever, but to try to make that into a cohesive book-type situation was so hard. It took a whole other part of my brain. It was a lot harder than I thought it was going to be when it was all said and done. Melanie: It’s hard, right? To figure out how to seamlessly put it together in a way that feels like coherent for the reader. Jen: But you did. All your books have—they’re all bestsellers, every one of them, and I feel like you've found your niche. You and I have a similar approach to book writing. At least my last couple, and you're all yours in that we sort of do an essay format, which I love. That's my favorite way to read. So therefore it's my favorite way to write too, when we can sort of take topics individually and write an essay about it. But still what you're saying is so true, because that's the way I like to write because I have a lot of different things I want to talk about, but my publishers are always like, “but what’s the theme?” And I’m like, “I feel like the theme is like just being a human, you know, just a human woman in today's world.” And they're like, “we need to dial it in a little tighter.” I’m like, “I don't know, because I like to talk about college football in one essay and then in the next one, God’s sovereignty. So like, I don't know what the theme is there is, guys.” I struggle with it. Let’s talk about Church of the Small Things. So Church of the Small Things just came out, just a minute ago. I love it. I'm serious. I love it. It is so good. 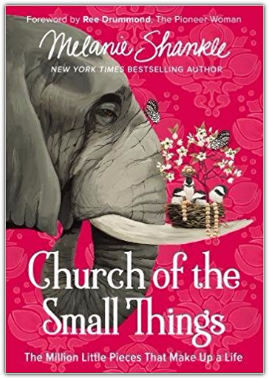 I feel like right now you are hitting your stride with your voice, and with your messaging, and with just your gift of writing, I think Church of the Small Things is your best. 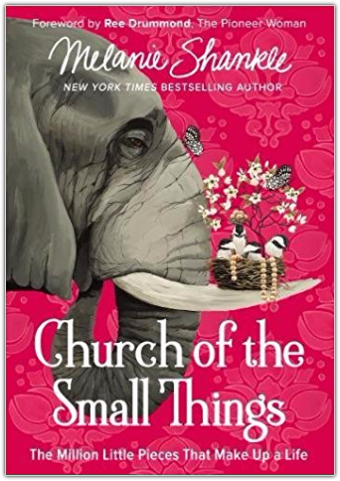 So it’s called Church of the Small Things: The Million Little Pieces That Make Up a Life. I basically want to marry this idea; like I do. It’s so wonderful, it's sort of this—well, you know—it’s your book. ​Tell everybody, what’s sort of theme--what's the theme in Church of the Small Things because I think it's so right. It’s so good for right now. Melanie: Oh, thanks. You know, it was funny, because it's like you said; when I was writing, what I was starting it out, I was like “I don't know what this next book is going to be.” You know, I've written on motherhood, I've written on marriage, I've written on friendship, I was like done. Those are the three things in my life. The end. So I was like, what's it going to be? I knew I wanted to write, so the first thing I wrote, was I think, it is in chapter two about my grandparents, and about going to the lake house, and just those summers. It just dawned on me as I wrote that chapter--which I didn't know what it was going to be--it was just an essay. That's what I remember--it's the small things, like, as we’re parenting and we're raising our kids and we feel this pressure. At that time, I was feeling all that pressure, because you know, in this writing/speaking thing that we do, it's so easy to start watching what everybody else is doing you. I can get in that place where I feel like everybody's doing bigger things than me. I have an only child. I'm like OK I'm theme child, I'm like poster child for Church of the Small Things. I have one child, you know, and I felt like I spent years--like God, am I supposed to adopt? What am I supposed to do? Should I be on a foreign mission field? What do You have for me? Surely it's got to be something, and it was like He kept saying to me like, “no, you dial in right where you are. This is where I have you, this is where I placed you. Find your peace and contentment here, walk your road right here, and that all tied into these stories that I tell about my grandparents. How they were so faithful. They were not worried about living this Instagram life. They didn't know about platforms, they didn't know about all that. They were just doing what they were supposed to do right where they were in the impact that they left. When my cousins and I get together, we're like their faithfulness carved out a whole generation of people who are good people, who know how to love their families, and love their friends, because we learned it from them and I'm like, that's what life’s all about. Jen: it really is. it's such a relief to read--it's hilarious and it's tender. Just your sort of guidance on this idea that a good life doesn't necessarily mean big, splashy, huge famous—that’s just so rare actually-- it's all these beautiful little moments that make up a day, that end up making up a life. And it is. I mean, you just nail it, and the whole thing feels so tender. You just feel like really loving toward your people, and toward the gifts that you have, and all the little blessings in your life, so you've got these great sections in the book called “Things I Wish I’d Known” devoted to everything from motherhood to high school. Could you tell everybody a little bit about how you came up with these and why you put them in there maybe talk a little bit about the list from high school? Melanie: I was sitting, you know it's funny how it comes together, and you're sitting there, and you’re like, “well what what else could I add to this?” Some of this, let's be honest, some of it is like, “how can I make my word count on this book?” Let’s be honest. Jen: Let’s tell the truth. Jen: What’s wrong with her? Melanie: That was so dumb. Like, guess what, she was going to learn how to hold a rattle. I didn't need to coach her through that situation. So I came through with high school, you know high school was such—we were in high school in the 80s. I feel like there were a lot of lessons that we had, and high school girls--you know this because you have one--high school girls don't look like we did. They're so much more savvy than we were when we were in high school, right? They have such a sense of themselves. They all look like these gorgeous—the high school girls now--they look better than I looked at 30, you know? They know about things like tweezers. They know about getting manicures and about getting your lip waxed if you have a mustache. Those are just some basic things that I didn’t know about in high school. In the 80’s, one of my things is that nautical themed attire is probably best for toddlers, or if you're an actual sailor. You don't really need to wear a sailor collar. Just because Leslie Lucks came out with it in a dress, doesn't mean that you need to wear it. Maybe don’t tuck your jeans into your socks because that just makes you look like an ice cream cone. It just creates this whole line, especially when your hair is like you’ve used two sets of hot rollers to roll your already permed hair. If your hair is a bigger circumference than your shoulder width, maybe you need to reevaluate. Jen: You know, these young girls don't even know about hot rollers. They've never laid eyes on it on a on a package of Clairol hot rollers. They don’t even know about it. Melanie: I mean, that was like my go to first thing in the morning. All high school. I mean you walked in the bathroom and plugged in those hot rollers before you did anything else. You got to get those babies heated up to get your best self that day. You got to get those curlers going. Jen: Oh man, and you'd burn all your fingertips off, you’d have like no fingerprints because of the hot rollers, but that was just the price we paid. I was just talking about something from the 80s on Facebook the other day, and one of my friends from seventh grade, my friend Julie, she pipes in and says, “Jen I remember in seventh grade when for Christmas your parents bought you an entire case--like 48 cans--of Aqua Net. That was one of my presents. It was so amazing. My parents love me. They loved me. This is what people for people they love. Jen: I've opened up an entire like ozone hole above the state of Texas, there's just no doubt about it. Nothing is better to me than laughing. That’s my favorite reach of all time, so I love that you make us laugh because life is really hard and weird right now. Everything is sad, and serious, and sober, and it is like a healthy practice to find places in our books, in our shows, in our relationships, where we can laugh, and be absurd, and be silly. You are one of the funniest people I know, but you know, you also have some vulnerable spots in your book too. You wrote about some real things, some hard things. Specifically, you have a really, really, really sweet letter telling your Dad things you might not say out loud, but you put it on paper. Can you talk about that a little bit? Did he read it? ​Melanie: So he read the book. He read it, and I laughed because my dad and I are super close. We always have been. You and I have talked about this--we have dads that probably overvalued us, which gave us probably an overly healthy sense of self-esteem at times. But he read it. I laughed because he e-mailed me and said “I love that chapter.” There are things that we just can't say because we're we always joking, and we’re always light hearted, and we always have. We know we adore each other, but it's just like it's too tender. Neither one of us can actually like say it. I felt like we passed a note. I sent the chapter to him and he emailed me back, and I was over the moon, and that just meant so much to me. He's always been such a constant in my life. I just adore him to no end. So to get to write that chapter--he really is such an example to me of how faithful he was, just time and time again in my life when it would have been easier. I always say--my parents were divorced--I didn't know that sometimes parents get divorced, and dads go away, or start a new family, or they leave. When I look back, and that he's still called me even when I lived two hours away, there wasn’t a night in my life--I think I was married before my dad didn't call me every night of my life to like say goodnight, and to check in on us. Jen: He’s just so sweet. Melanie: He's just so precious and I just adore him to no end. That chapter meant so much to me. It was one of those that you can appreciate. Like I'd bawl the entire time I was writing it, like could not stop like crying, even to this day. I had trouble with the audio book, like I don't think I can make it through this chapter. Jen: That’s too much. Yeah. I wrote an essay in Moxie called “Dear Parents” and it was very, very similar. I boo-hooed during that on the audio recording. I couldn't even get through it. My audio engineer was looking to me like, shrugging, like “should I stop tape?” I’m like, “let’s just roll—I will never get through this. Never. We can try twenty-nine times in a row and I will cry every time.”. Melanie: Not even a million times. But isn't it true though, that the older you get as a parent and as you see what it looks like, it makes you look at your parents and go, “wow, like you did it so right.” None of us have a clue what we're doing. But they did. I mean he just he did an amazing job. He's just an amazing guy so. Jen: That’s so nice. So sweet. Let's do this let's wrap this up here. We're going to do kind of like a down and dirty, rapid fire questions here. Here's the first one. We tailor this for the series. What's your like funniest, or craziest, or wildest, or whatever fall football memory? Melanie: When I was a student at A&M. When I was a student at A&M, it was the year we had made it--A&M had made it to the Cotton Bowl. We were playing Florida State in the Cotton Bowl. This is a big game. So a bunch of my friends and I, we all went to Dallas to spend New Year's Eve because the game’s always New Year's Day. I will say, I was not living my best Christian life at that point in my college career. So we went out that night, and went out to deep Elam, and we stayed out til like 2:00 in the morning and just partied. Had the best time. Then we got home and we were staying at the hotel where the whole football team is. I really hate to say this, but as it turns out some of them were staying on our floor, and we basically woke up the entire Aggie football team when we got home that night. Melanie: Then I'm going to say they didn't really play their best game the next day. As we sat that there. But my favorite memory of that whole thing is that we all pulled into that game. We were so tired. We'd all had too much to drink the night before, we were so hung over, we were like typical college students. We had blown all our money the night before, and so we had to enough money between my six friends and to buy one hot dog. We were starving. We bought one hot dog and we passed that sucker around and we all took a bite of it as we watched the Aggies. I think the final score was like 8 to 2--we scored a safety. It was too much. It was freezing cold. We couldn't afford anything. We ate that hot dog. One of our guy friends was with us and he was like “who has a scissor tooth?” I'll never forget that because the hot dog was like all jagged when we passed it. Jen: Being in college was so funny. Melanie: Cause you’re just so dumb. You have no sense. Jen: If you haven't shared one hot dog between six people. you have not had a good college experience. Melanie: Because you were down to you r last two dollars, because you're out of town, and you didn't have enough sense to maybe save money for gas money. Jen: Oh that's amazing. Oh, we love football in the fall. Here's another question though; do you have any other fall traditions or activities that you and your family love? Melanie: You know, one of the things that we do in the fall that I love--and you'll appreciate this because it’s a Texas Halloween. We love Halloween at our house. Melanie: Oh, it will be like full out. As Caroline's gotten older, for her to make the yard creepy is like her favorite thing. I knew that she was like officially like our DNA when we had a spider web on the front porch and she was like, “hold on a second.” She’s got this Madame Alexander doll her grandmother had given her as a baby, and wrapped it in the spider web, and made like the little spider was like eating the baby. I was like, “well, that's purely horrific.” But we live at a corner house in the neighborhood where we get so many trick or treaters. I feel like one of my favorite things is, I make a big pot of chili, and we sit out on the front steps and eat our chili. We have chairs, and neighbors come by, and I just love Halloween night. I think it's so fun to watch all the kids and all the stuff. I mean listen, a lot of times it's like 85 degrees and we're sitting out there. But we still do it, we still pretend like it's cold. It’s just so fun to me. I just adore that. Jen: I didn't know you did that. We literally do the exact same thing, and we've done it for 15 years, and it's so much fun. We do a big inflatable in our front yard. Melanie: Oh, that’s perfect. I love Halloween too. All my kids are big now and I don't care. It's not even going to slow down my enthusiasm at all. We're still doing the whole deal. Melanie: I love seeing all the littles. Getting all the little kids to come up to your doorstep. They’ve got their little princess costumes and their Buzz Lightyear, and all their little stuff. I just adore it. Jen: OK. That’s a good one. Okay, so last question. This is Barbara Brown Taylor's question that I love, and it can be anything. It can be real. It can be funny, it could be big. What is saving your life right now? Melanie: I really have designated, for the most part like Mondays are my new Saturday and it is the best because you just need that time. So I let myself watch Netflix. I let myself read a book, I let myself go shop, or do whatever it is I want to do on Mondays, and I don't feel that pressure, and I feel like that's saving my life in this busy season of life. Because if I don’t have that time to regroup, because I’m an introvert, then I am just a horrible person to be around. Jen: So tell everybody where to find you, what you're working on. Where do they find your schedule? All of that. Melanie: You can always find me in my blog it's either the BigMamaBlog.com, or you can get it at MelanieShankle.com. The books are everywhere books are sold, so you can get them at Amazon, Barnes and Noble, whatever your favorite little bookstore is. They should be there. So right now I'm working on--I have a devotional for grown women that comes out in March and it's called Everyday Holy and it's going to come out at the end of March. Then I'm actually working on a devotional book for tween girls right now. Jen: Awesome. We'll have links to all of that on the transcript you guys, over on my Website too, if you missed it, if you're driving, if you didn't get a chance to grab it. Alright, sister. Hey, thanks for being on today. Melanie: Thanks for having me. It was so much fun. I appreciate it. I hope people have a good rest of the fall. Jen: All right. Talk to you later. Jen: Alright. That was a fun hour. I think I could talk to Melanie on the phone for days upon end, and all we do is laugh and cackle. I hope you enjoyed that--she's so great. Every thing that we mentioned; all her links, her books, her website--everything. I'll have it on the transcript over on my blog, JenHatmaker.com. Just in case you didn't have a chance to write it down, or you didn’t remember what the titles were. Melanie is just fun. She just makes you love your people better, and love your place in life better, and love God better. One of my favorite people Tip-Top ever people. Hey, thanks for joining in every week you guys. The series is really fun, and we’ve got great guests for you. Really, really great guests. In this whole series we’re kind of tackling all sorts of ideas about fall and the holidays, so can't wait to be back with you next week. Thanks as always for listening in. Thank you for those of you who have subscribed, who have left reviews and ratings that's like great. That's great for podcasts. I appreciate everybody who's taking the time to do that, and we read all of them, of course, so we're really listening to you, and paying attention on how to get better, and how to serve you better, and what you're interested in. So I appreciate you sticking with us week after week. I'm having the most fun ever with you. So you guys have a fabulous week and I can't wait to join you next week. Bye everybody. Narrator: Thanks for joining us today on the For the Love Podcast. Tune in next week, when we sit down again with Jen and friends to chat about all the things we love. 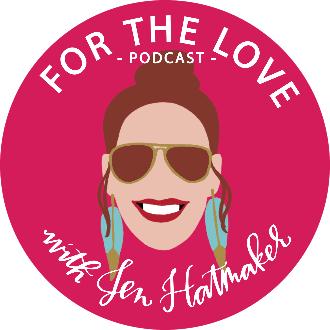 We love you, our listeners, so we want to be sure you subscribe to “For the Love,” with Jen Hatmaker, via iTunes or your favorite podcast provider, so you don’t miss a thing. And if you have a minute, please leave us a review. To become a part of Jen’s online community, visit JenHatmaker.com and sign up for her newsletter. It’s full of all the things you love, including free stuff. We love free stuff! Thanks for listening, and see you next time on For the Love, With Jen Hatmaker.